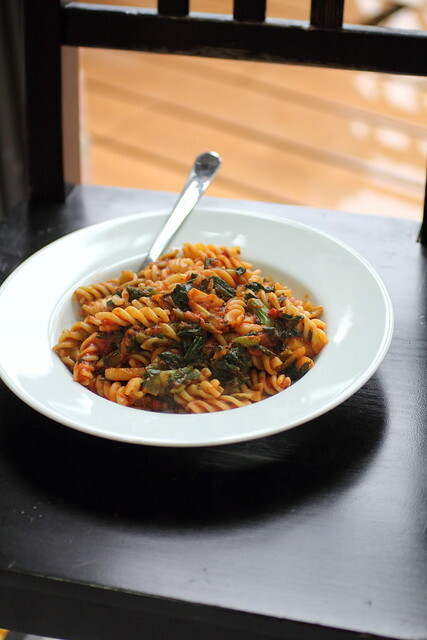 A while ago I featured cookin' greens, the frozen bag of chopped greens in my holiday appetizer post and today I'm sharing a quick healthy pasta ideas! I love delicious dishes that come together using leftovers. Here I threw together a dish that used my favourite pizza sauce which has been laying around in the fridge (watch out, it's spicy because it's got GINGER in it! Dry and tons of fresh grated ginger root) My ginger sauce is also the base of the dipping sauce I used for my mini lamb meatballs with the moroccan twist last week as an appetizer/light meal as well. 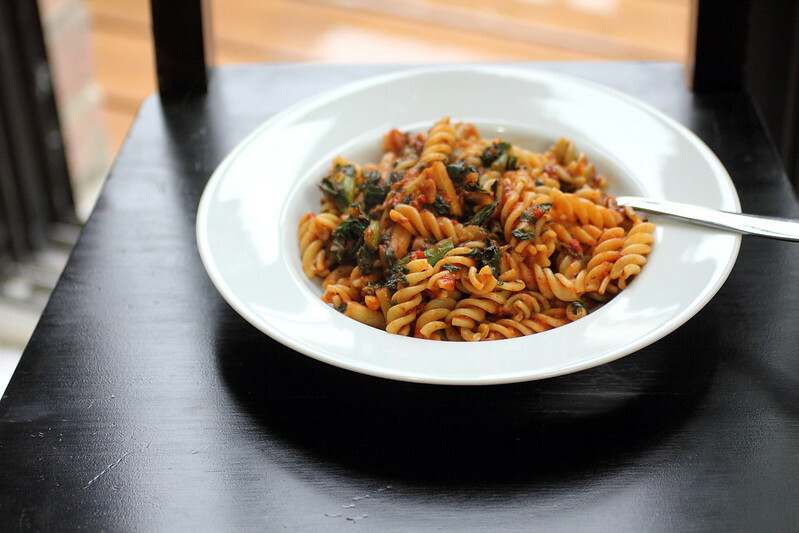 Now that I had this spicey tomato sauce on hand I knew it would stand up perfect to all those greens with character. I boiled the pasta, set aside. I steamed the greens adding a bit of chicken stock, use veggie if you want to go vegetarian since this dish has no meat in it. Once the greens are steamed, stir in the tomato sauce and toss with pasta. Add some chili flakes if you like it spicy! Perfect for a rainy winter day! I steamed a bit and threw it in with the sauce. It was totally delicious!